General Chart on Mercator's Projection. 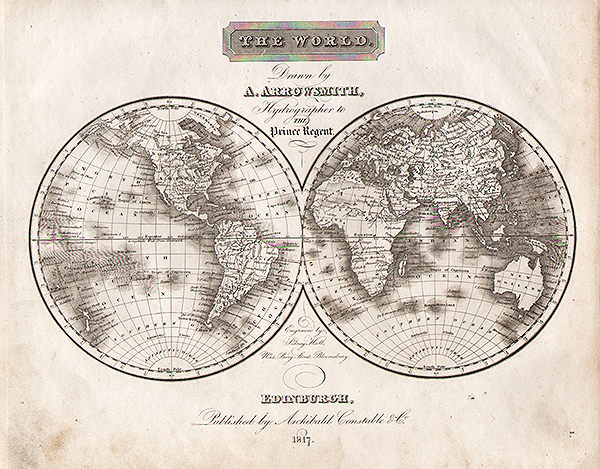 An antique map 'Engraved for Adams's Atlas' and 'Published by Wm. Darton and Jos. Harvey, Dec. 30th, 1803 with contemporary hand colouring. Has three vertical folds. 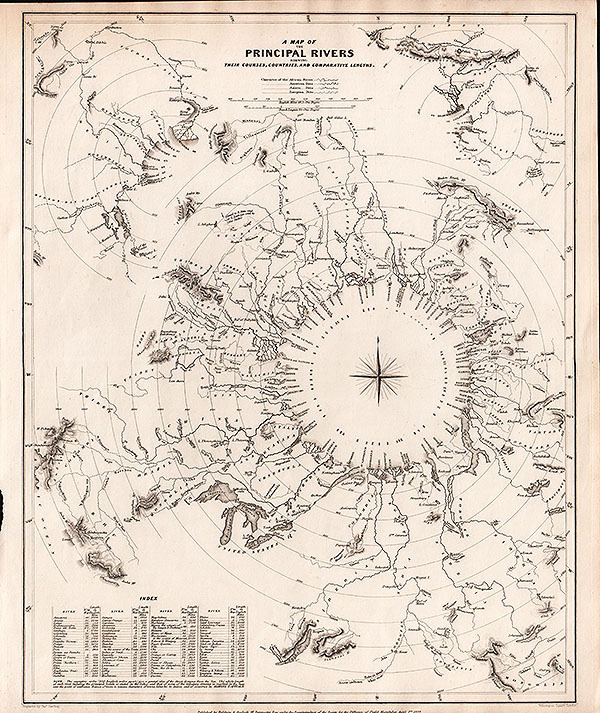 A Map of the Principal Rivers shewing their Courses, Countriesand Comparative Lengths. Antique map engraved by J. & C. Walker, published under the superintendance of the Society for the Diffusion of Useful Knowledge April 1st, 1834. A Comparative View of the heights of the Principal Mountains and lengths of the Principal Rivers of the World. More Info A comparative view of the heights of the principal mountains and lengths of the principal rivers of the World. Engraved by Fenner, Paternoster Row. Published (London) by Joseph Thomas in 1835 with contemporary hand colouring. 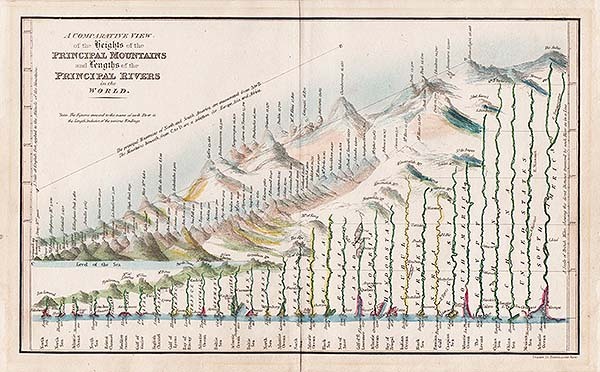 A comparative view of the heights of the principal mountains and lengths of the principal rivers of the World. Engraved by Fenner, Paternoster Row. Published (London) by Joseph Thomas in 1835 with contemporary hand colouring. Orbis Veteribus Notus - Aaron Arrowsmith. An antique map of the Eastern hemisphere in the Ancient World, showing Africa, Europe, Asia and 'New Holland' now known as Australia. Great deal of the area covered shoen in outline only. London, Published by Aaron Arrowsmith, Hydrographer to His Majesty, No. 10, Soho Square. Published in "Orbis Terrarum Veteribus Noti Descriptio. A Comparative Atlas of Ancient And Modern Geography, from original Authorities, and upon a New Plan For The Use Of Eton School" January 2nd, 1828 with original outline colouring. Eastern Hemisphere - Aaron Arrowsmith. 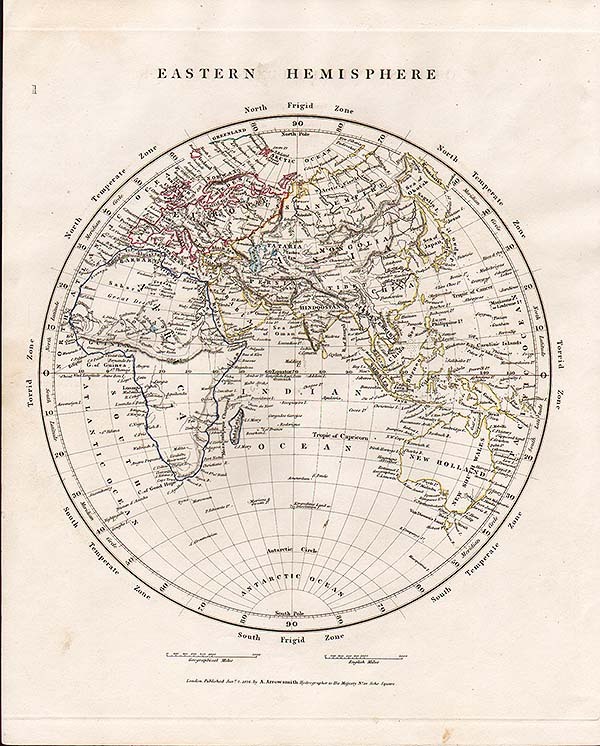 An antique map of the Eastern hemisphere showing Africa, Europe, Asia and 'New Holland' now known as Australia.London, Published by Aaron Arrowsmith, Hydrographer to His Majesty, No. 10, Soho Square. Published in "Orbis Terrarum Veteribus Noti Descriptio. A Comparative Atlas of Ancient And Modern Geography, from original Authorities, and upon a New Plan For The Use Of Eton School" January 2nd, 1828 with original outline colouring. Western Hemisphere - Aaron Arrowsmith. 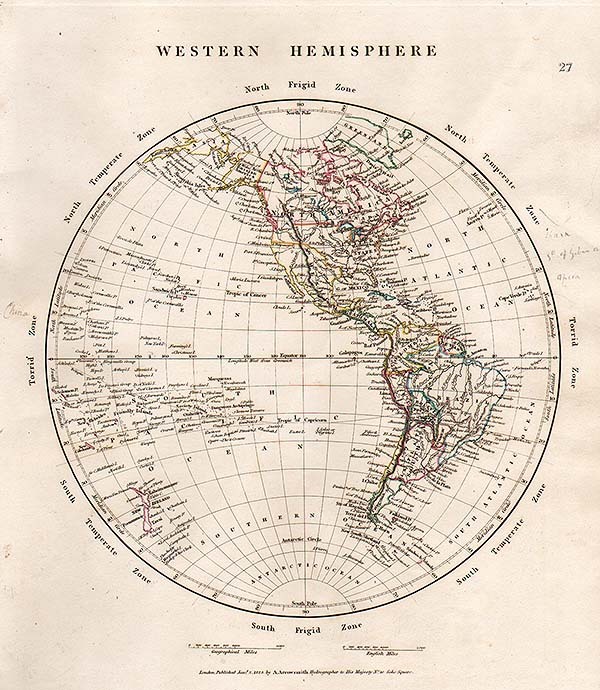 An antique map of the Western hemisphere showing New Zealand and "Russian America" in the west, Canada, North and South America, and the Azores and Cape Verde in the east. London, Published by Aaron Arrowsmith, Hydrographer to His Majesty, No. 10, Soho Square. 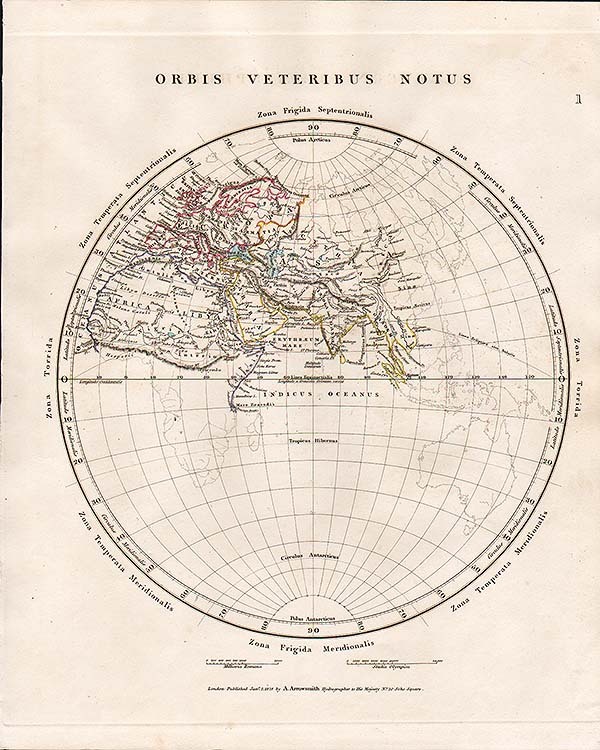 Published in "Orbis Terrarum Veteribus Noti Descriptio. A Comparative Atlas of Ancient And Modern Geography, from original Authorities, and upon a New Plan For The Use Of Eton School" January 2nd, 1828 with original outline colouring. The World - Aaron Arrowsmith. 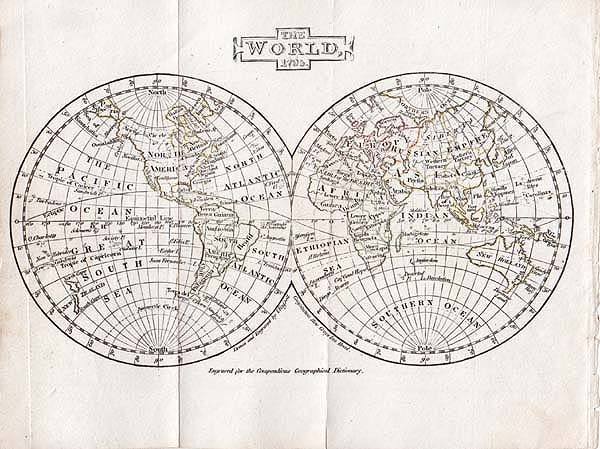 The World on Mercator's Projection - Aaron Arrowsmith. Darluniad y Ddaear, sef yr arddrych ddwyrain a'r arddrych orllewin, gan Robt. Roberts o Gaergybi. 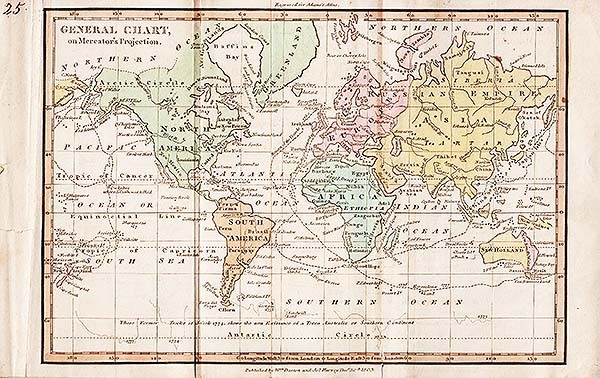 The World, 1795 - J. Russell. 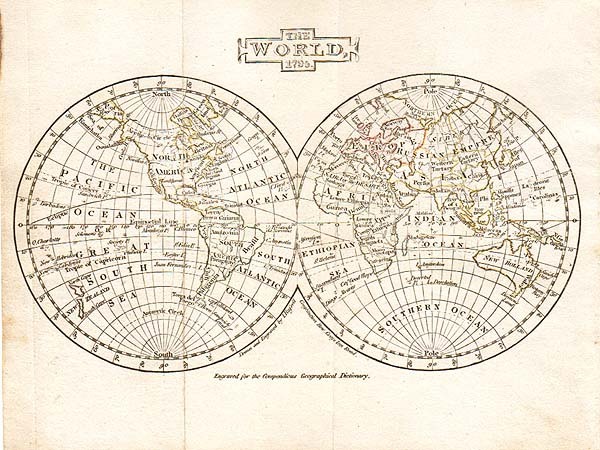 An antique map of 'The World, 1795' drawn and engraved by J.C. Russell. Published in the 'Compendious Geographical Dictionary' by Richard Brookes. Circa 1802. Original outline colouring. 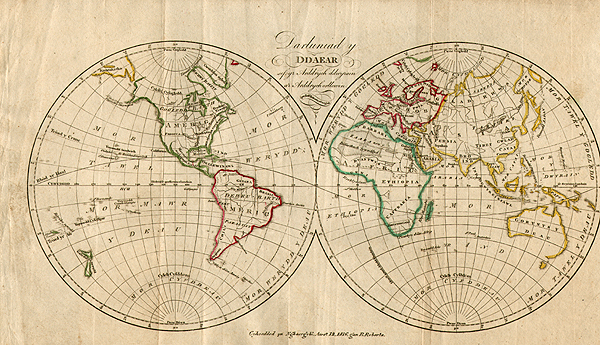 An antique map of 'The World, 1795' drawn and engraved by J.C. Russell. Published in the 'Compendious Geographical Dictionary' by Richard Brookes. Circa 1802. All margins closeley cropped. Rigobert Bonne - Orbis Antiquus. More Info An antique map by Rigobert Bonne 'Primario Hydrographo Navali' the important French engineer and cartographer (1727-1795) who succeeded J.N.Bellin as Hydrographer at the Depot de la Marine (1773). 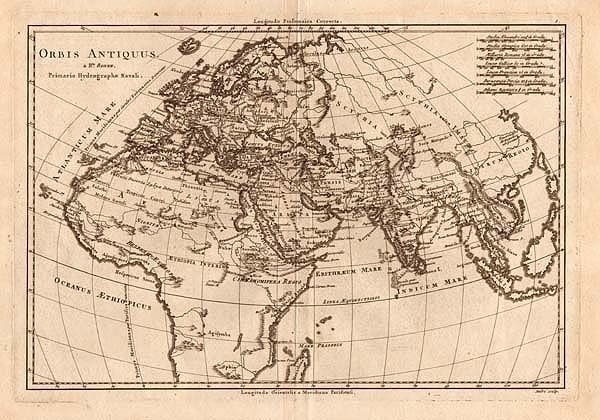 This detailed map of the Eastern Hemisphere: Europe, Africa, Asia was published in the "Atlas Encyclopedique" . Circa 1787. Engraved by Gaspar André. An antique map by Rigobert Bonne 'Primario Hydrographo Navali' the important French engineer and cartographer (1727-1795) who succeeded J.N.Bellin as Hydrographer at the Depot de la Marine (1773). 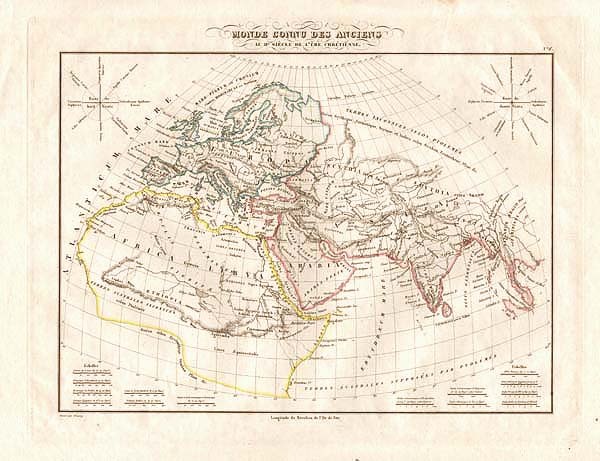 This detailed map of the Eastern Hemisphere: Europe, Africa, Asia was published in the "Atlas Encyclopedique" . Circa 1787. Engraved by Gaspar André. Monde Connu des Anciens - Thierry. More Info An antique map of 'Monde Connu des Anciens, au IIe Siecle de l'Ere Chretienne' by Conrad Malte-Brun (12 August 1755 - 14 December 1826), engraved by Thierry. Continent boundaries are trimmed in color. Major relief shown by hachures. Rivers, lakes, islands, and regions shown. Shows 14 scales. The text is in Latin. Circa 1837. An antique map of 'Monde Connu des Anciens, au IIe Siecle de l'Ere Chretienne' by Conrad Malte-Brun (12 August 1755 - 14 December 1826), engraved by Thierry. Continent boundaries are trimmed in color. Major relief shown by hachures. Rivers, lakes, islands, and regions shown. Shows 14 scales. The text is in Latin. Circa 1837.